Sunday was Yom HaShoah, Holocaust Remembrance Day, and it was observed by Jews all around the world, including a very moving ceremony held at Congregation Adas Emuno. My name is Pier Marton, I was born and grew up in Paris, five years after the war. My parents' stories of survival are stories of resistance. The odds and the times were against you two, but between luck, being politicized and smart, you both managed to make it. Papa, in 1937, you left Budapest, Hungary for Paris, to establish your second studio of the artistic Modern Revue, which was to have offices in Budapest, Paris and New York. You advertised your artwork in Esperanto (the language which means “one who hopes”, created by another Jew, Dr. Zamenhof, an ophtalmologist from Bialystok, a man of great vision). You had designed some stamps with the star symbol for Esperanto. You hoped Esperanto could become the universal language of the future, to eliminate like communism, the injustices and the misunderstandings between people. It needs to be clear, there was no such thing as “The Holocaust”, we spoke of “the war” throughout my childhood. I remember you telling me, I was possibly 8 years old, about the bullets flying by your head as you were waiting for the German convoy that you were to ambush, right from the rooftop of that last building you moved into, to escape arrest. That’s the building I grew up in, where we lived below the roof, in an artist’s studio that had been vacated because it was too close to a munition factory, and in danger of being bombed. I remember being amazed by looking at the sawed off metal bars by the window in the loggia, the small room where we all slept and where one could not stand up because of the low ceiling. If someone was going to arrest you, the escape route was clear: it would take a second to lift off those metal bars. To a casual observer they looked normal, but if one looked very carefully, black paint was hiding the cuts. They remained there throughout the 21 years I spent in that apartment: reminding me of the need to have both vigilance and an escape route. At another time, you told me that the police interrogated you and that they released you. You also spoke of hearing the police going through another apartment you had lived in, Rue Daguerre, as you were walking up the stairs. I remember seeing that photograph of you with the medal you received upon the liberation of Paris. But you did not expand, I had to fill in the many gaps. One cannot ever know the life of another, do we even know our own lives? Many years later, in a book by the famous Spanish writer, Jorge Semprun, strangely enough, there was a character with my name, as Semprun describes a resistance network in my own street. As a curious child, going through the closets I did find a book, the most horrible book I was to ever look at, with piles of mutilated and sawed off bodies, collections of tattoed skin [I let youimagine the rest]. It established for me the need for solid documentation of human rights abuse. THERE, was one of the loudest screams emanating from these pictures, a sound that says in the most urgent manner, WAKE UP, something terrible was happening, and IS CONTINUING TO HAPPEN. OPEN YOUR EYES, even if it is difficult and painful. From time to time, we visited that family in Freiburg. You had hidden the father, Henri, a German deserter. But we did not speak about the past, we were in the present. Later, the puzzle came together further when the letters you had mentioned, “FTP-MOI” became those of the notorious network, mocked by the Nazis in the famous Red Poster, characterizing the resistance as Jews, foreigners, and communists - which in your case was completely true. Those 23 who were arrested and executed by the Germans were immortalized by the famous French song, L’Affiche Rouge. Your trust in people was repeatedly broken. It might have started as a kid on a tramway car in Kiskunfelegyhaza, the small town in Hungary where you grew up, when you had asked a stranger for the time. He had answered: “I don’t have to tell Jews the time”. You did not volunteer much, you did not want to talk about any of this ever. I think you wanted for us to walk straight, trust the world. You did not speak much, but when you spoke, you meant it. You would say: "Alles ist halb so wichtig/everything is half as important” which you attributed to Ernst Toller, the left-wing Jewish playwright. Like for most children of survivors, WHAT WAS NOT SAID had the most impact. One could say that we received the war, like our mother’s milk, through our body (the transfer was not through words). Our history books and our lessons: how we all breathed, how we walked, and how we used our brain... and even how we smiled. We became specialists in the topic. Our bodies were the place where we heard the stories. We had to know what to ask to get answers. That’s how you told me that you had to step over so many cadavers when walking on the streets at the liberation of Budapest. For the sake of time, I will ask you to read the stories which are described on the panels outside in the lobby. These are stories I heard for the first time as my mother spoke to a TV crew when we were both in Salt Lake City for the opening of my video installation “JEW”. The message was clear: work for the public good and do not trust the powers that be... a politics of non-politics. THE PEOPLE WHO DIED AND THOSE THAT SURVIVED WHILE BEING ATTACKED FOR BEING DIFFERENT, THOSE ARE THE RESISTANCE FIGHTERS, THE HEROES. AND THE RESISTANCE, THE RESILIENCE THAT WAS THEIRS IS NOW OURS. For more information about Pier Marton, you can take a look at his websites: http://artsci.wustl.edu/~marton and http://piermarton.wordpress.com. 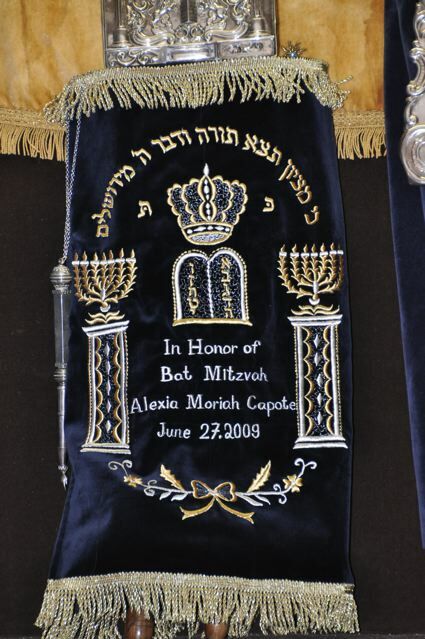 The Sefer Torah was the subject of a recent post here on our congregational blog, A Sister Shul's Torah Restoration, and while the old saying tells us that you can't judge a book by its cover, we do like to honor our sacred scrolls with special coverings and decorations. Judging by this particular cover, our Torah will be well cared for, and our congregation will be grateful to the Capote family for many, many years to come. Once a month, on the first Saturday afternoon at 2 PM, Congregation Adas Emuno holds a Shabbat Meyuchad service that has been designed to be especially appealing and welcoming for people with developmental disabilities and their families. The service is open to all, of course, and can be appreciated by and meaningful for everyone. But it is also meant to be especially welcoming and comfortable for families and individuals touched by autism, and other forms of disabilities. The service is called Shabbat Meyuchad because it is an afternoon service, and as Sabbath services go, it is brief, and highly musical. The idea for the service came after our spiritual leader, Cantor Shapiro, worked with my daughter Sarah, who has moderate autism, to give her an uniquely-tailored Bat Mitzvah ceremony a year ago. And this made for a great story for our local cable news program, as you can see from the video below. A brief note: The person who came to film us on a weekday afternoon made it a point to get us to pronounce all of the Hebrew words correctly, but somehow the anchor was not able to get it right when she said "Adas Emuno" (should be ah-Dahss eh-Moon-oh), "Meyuchad" (should be may-Yoo-chahd), and even "Shabbat" (should be shah-Baht)! And their use of the phrase, "mentally challenged," in reference to individuals with developmental disabilities is inappropriate. The question of inclusion comes up quite often in discussions relating to the education of people with disabilities. Religious inclusion does not receive anywhere near the same amount of attention, but it is very much relevant to inclusion in general, to be a part of one's family and community. And while you might expect it only natural for religious institutions to make the effort to include individuals with disabilities, all too often that's not the case. It means a great deal to me and my family that our congregation has that kind of openness, and is willing to make the effort. The next Shabbat Meyuchad service is this Saturday, all are welcome to join us!